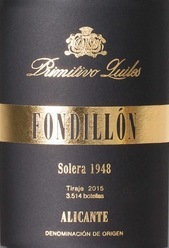 The Fondillón has always accompanied us in the cellar; the founder, Primitivo Quiles Verdú, was well aware of the historical significance of our wine and thus joined the winery a Solera of Fondillón started in 1892 belonging to the family, and it was consisted of two barrels; thereby posterior generation called it "Gran Fondillón Solera El Abuelo" years later. This solera produced between 200 and 300 bottles every bottling, only in years when the wine reached sufficient quality, we made a new bottling, as in the present. During the Spanish Civil War the cellar was used as storage for aviation materials where all the wine were ravaged and confiscated, with the exception of the two barrels mentioned above that miraculously managed to be saved. In the 50s of last century it was decided to replace one of the two barrels with Moscatel wine instead of the old Monastrell which to date has been in use, thus forming a "new flavor" sweet wine called "Gran Imperial". Thus, the "Solera El Abuelo" of Fondillon were reduced to a single barrel and is currently preserved in production. Although the main production of the winery in those days were red and youth wines in general for marketing in Spain and in foreign countries, the idea of having a significant production of Fondillón had always been present, and even more when all Fondillon producers in Alicante disappeared (the last one was Samper of which one bottle is kept by us) and only a small production of our solera "Gran Fondillon El Abuelo" was in the market. Our father keeps alive the memory from his childhood of “corredores” coming to our cellar to sell wine and saying to his grandfather: "taste asto Don Primitivo es fondellol" (try this Don Primitivo, it is fondillon) this means the word Fondillón remained synonymous of excellence and quality although its period of splendor was over. That time came in the harvest of Monastrell of 1948 that was great in quality and quantity and a temporary drop in demand, allowed to keep more wine than usual in the barrels, sufficient to start a new solera Fondillón that would be market in the late 60s. By this way the Fondillion recovered a continuous presence in the market, which years later fortunately, it has been reinforced by others new fondillon producers. ​During all these years, a work of historical research and promotion of Alicante Fondillón with the claim that our historic wine resurface again and be present in the minds of consumers and the desire for new producers was performed, reaffirming at the same time the fact that excellence can be achieved with wines from Monastrell of Alicante, leitmotiv of our history. Today we welcome as there are about a dozen firms in the Alicante Designation of Origin developing its own Fondillón and the Monastrell grape has regained the prestige that should never be questioned in our land.